Dr. Henry Heimlich, who invented the maneuver used to help victims of choking, has died at the age of 96. He died at a hospital in Cincinnati on December 17 following complications from a heart attack he suffered on December 12, his family says. Dr. Henry Heimlich invented the lifesaving technique, which uses abdominal thrusts to clear a person’s airway, in 1974. 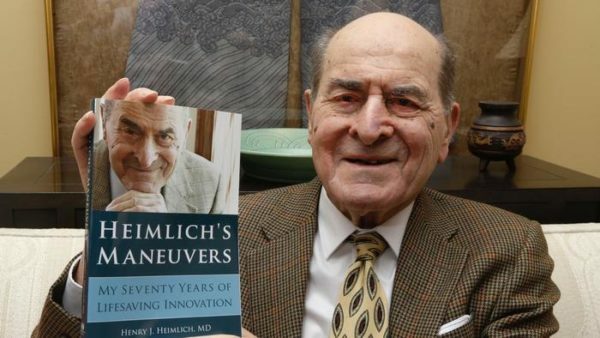 Dr. Henry Heimlich was director of surgery at the Jewish Hospital in Cincinnati when he devised the technique. In a statement released to the media, Dr. Henry Heimlich’s family said he had been “a hero to many people around the world”. The anti-choking maneuver was not Dr. Henry Heimlich’s only success. In 1962 he developed the Heimlich Chest Drain Valve which was credited with saving many soldiers’ lives in the Vietnam War and is still used for patients undergoing chest surgery. Since Heimlich technique was introduced in 1974 it is believed to have saved the lives of more than 100,000 people in the US alone. They include former President Ronald Reagan, Cher, former New York Mayor Edward Koch, Elizabeth Taylor, Goldie Hawn, Walter Matthau, Carrie Fisher, Jack Lemmon and Marlene Dietrich. In 2014, Clint Eastwood was credited with saving the life of a golf tournament director in California who was choking on a piece of cheese.